Business woman touching virtual display. Business and technology concept. Photo courtesy of Shutterstock. 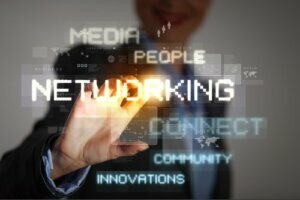 Networking is an opportunity to meet new people who can potentially become contacts. As a job seeker, networking gives you the chance to talk about your job search. With the right contact(s), you can take another step in finding a new job. So, when opportunities arise to network, how can you take advantage of them? Consider these three ways to make the most of your opportunities. Keep interest on information – When meeting someone for the first time, you don’t want to directly ask him or her for a job. Your conversation should be focused on getting information that will benefit your job search. For example, ask questions about the company this person works for or how to gain experience in the field you are interested in. Put questions in order – By ordering your questions, you will appear organized and focused. In addition, placing your questions in a particular order may allow your contact to answer some of them before you ask. This in turn saves time for any questions you think of before the meeting is over. Follow-up – Not too long after your meeting, be sure to send a thank you note to your contact to show your appreciation for his or her time. Also, if you learn about anything that your contact is interested in such as a specific topic in a newspaper article or a link, share it. This can create a connection, as well as keep you in your contact’s mind should they hear about new opportunities relative to your job search. Networking gives you the chance to meet new people. If you are searching for a new job, finding the right contacts can help you get closer to getting one. Remember though, once you have the opportunities to network, it is up to you to make the most of them. William Frierson is a staff writer for CollegeRecruiter.com.